FOR 1986-7 BUICK TURBO REGALS! To Scott Atkinson is using our Big Mouth cold air kit and is running mid 10's with his white 87 Turbo T.
Were you one of those Turbo Regal owners who bought in to the ram air theory for better performance? It has been proven that the canisters used in those systems are more of a restriction then a performance enhancer. I relocated the air filter on my 1987 Grand National to in front of the radiator support and got rid of the ram air canister, scoop and hose. 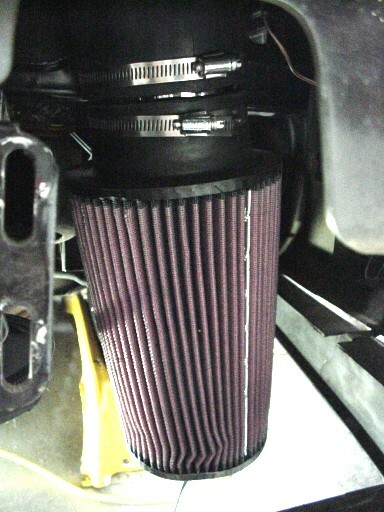 Now my motor gets fresh cool air from out of the motor compartment thru a huge 4" inlet K&N filter. 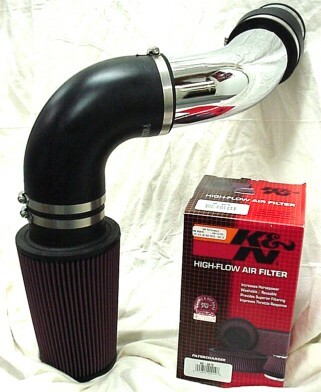 Parts included are a new 9" K&N air filter with a 4" inlet, a 4" O.D. 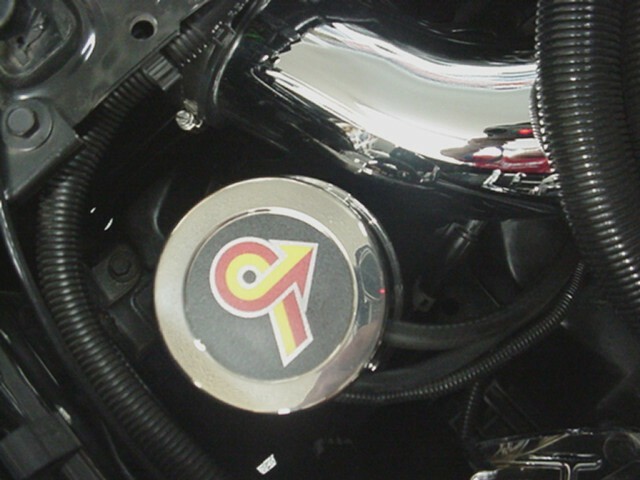 45 degree elbow available in polished aluminum, a 90 degree rubber elbow with hose clamps that goes thru an existing hole in the radiator support and reducer connector to hook to your stock Buick OR Chevy style MAF sensor. A hole is drilled in the adapter for easy installation of the MAT sensor if requested. SOME NOTES! You can use this kit with MOST solid MAF pipes that are available from aftermarket vendors but you may have to alter the length on them. To ensure a perfect fit I suggest that you purchase one of our solid MAF pipes that are designed to work with our kits. This kit is not designed to work with the factory flexible air duct. 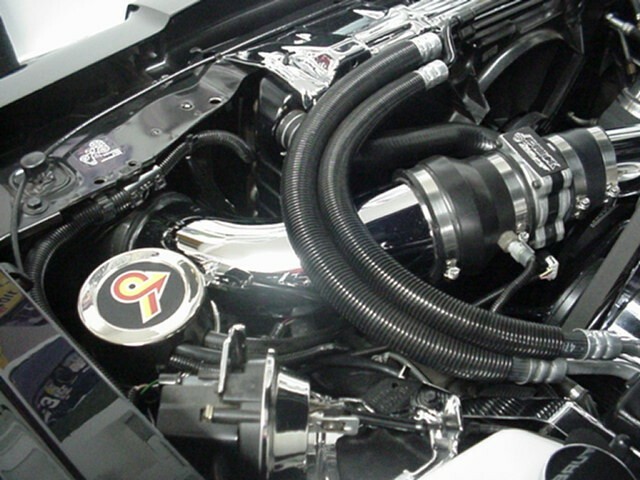 This is a picture of the parts supplied with the Big Mouth Cold Air kit in polished aluminum. This kit will fit thru the opening of the radiator support without any alterations to the opening. This is the polished aluminum kit with rubber elbow fully assembled. The kit comes complete with all necessary clamps and adapters and is also available without the air filter. For a complete turbo to filter setup order one of our MAF pipes! VERY IMPORTANT! Our cold air kits use a 9" K&N cone filter with a 4" opening, this is where the BIG MOUTH name comes in. 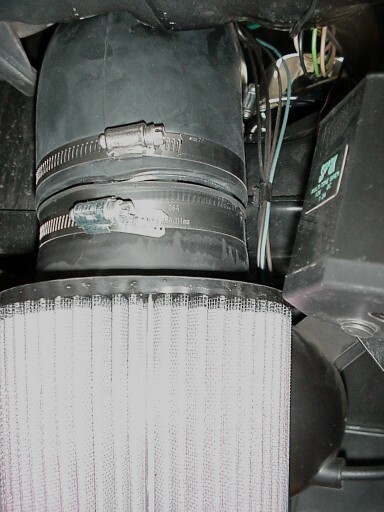 It WILL NOT work with the 3" inlet filter a lot of Turbo Regal enthusiasts are already using under the hood that is attached directly to the MAF sensor. 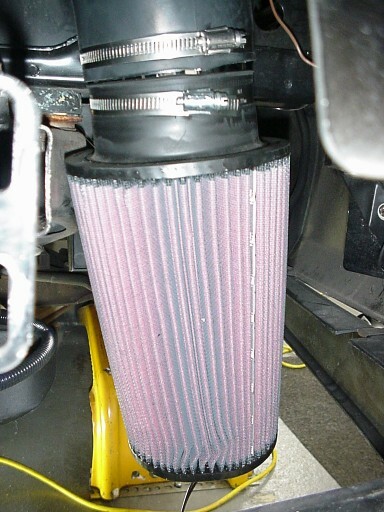 If you are ordering the kit without a filter be sure you have a filter that has a 4" opening! If you currently are running a stock Buick MAF sensor and plan on upgrading in the future to a Chevy MAF sensor, please be aware that you will need to order a new 45 degree metal elbow for the kit to work. The Chevy MAF sensors are about 2" shorter than the Buick which necessitates a longer metal elbow to compensate. I CAN supply these separately if you need one in the future, just email me for pricing. For those of you who have converted over to the newer style Chevy MAF sensors; we can make a longer 4" 45 degree elbow that will work with these shorter sensors but need to know up front that you are using one. Installation is very easy and some small but easy modifications may be needed for the perfect fit. 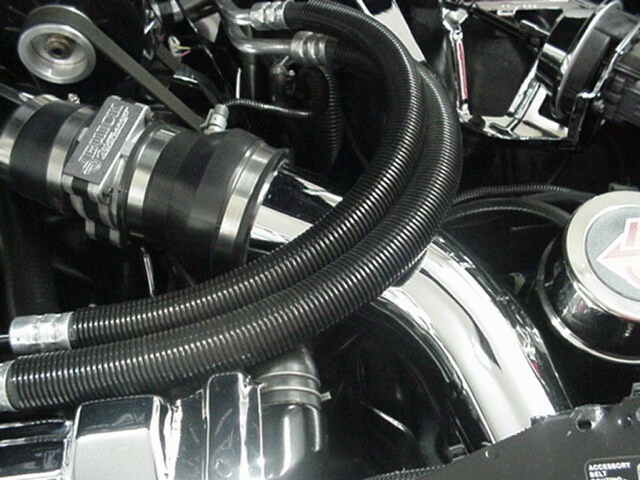 Your fuel vapor canister will have to be moved over about an inch or so for clearance to the 45 degree elbow and I suggest cutting the upper radiator hose where it attaches to the radiator about an inch for additional clearance. You can also relocate the canister down to the frame rail near the steering box. You will see a little alcove in the plastic fender liner and it fits there perfectly. These kits are made to order and may take up to two weeks to deliver depending on inventory. Usually I can get your order out to you within a week upon receiving payment. IMPORTANT! The BIg Mouth cold air kit does NOT come with the MAF pipe. We offer 3 different sizes of MAF pipes and they must be ordered separately. Please note that the pics of the filter above were taken when I had the front bumper of the car to install an aluminum bumper brace. Thought it was a good opportunity to show the position the filter is mounted in. 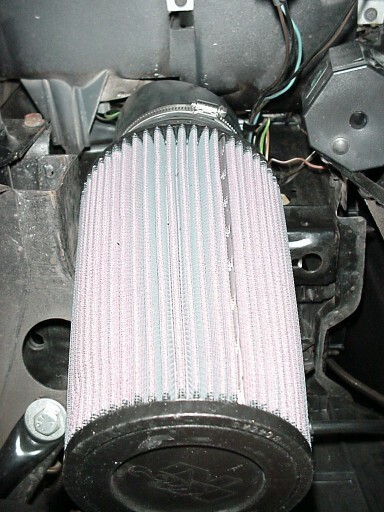 When properly installed the filter will be even with the front air dam and can not be seen. MAF PIPES ARE ALSO AVAILABLE IN VARIOUS SIZES - SELECT THE APPROPRIATE SIZE FOR YOUR APPLICATION FROM THE LINKS ON THE SIDE OF THIS PAGE. 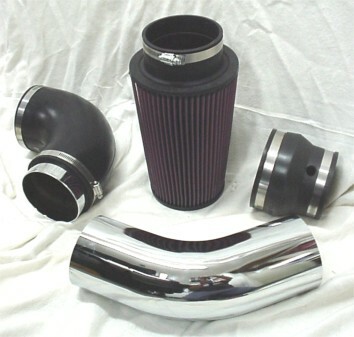 To make a complete air induction kit from the turbo to the air filter be sure to order one of our MAF pipes. Available in polished aluminum. BIG MOUTH KITS - Order Below! BE SURE TO LET US KNOW WHAT COLOR HOSES YOU WANT BY CHECKING THE PROPER BOX BELOW! Please answer the following questions so we can supply you with the correct kit for your application. PLEASE CHECK ONE OF THE FOLLOWING! (A little information for the novice! 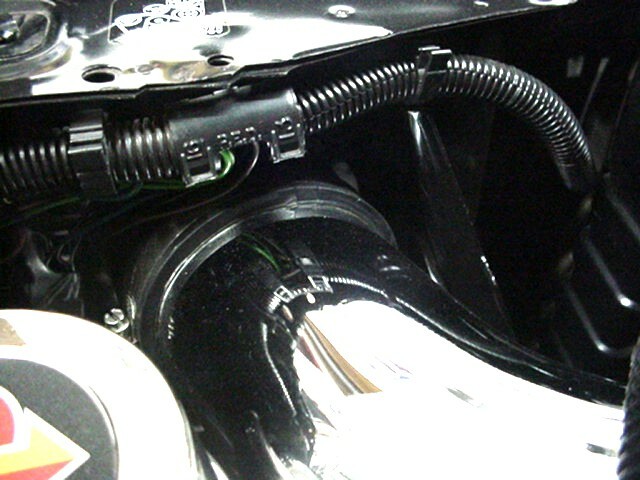 The AIR TEMP sensor is the small sensor that screws into the air intake before the MAF sensor. It senses air temperature and some owners do not use this. . Please be sure to check the proper box so we can send you the correct part! 45 DEGREE REPLACEMENT PIPES - Order Below! If you were running one of our cold air kits and are planning on converting to a Chevy MAF sensor OR if you are eliminating the MAF altogether, you will need to order a replacement 45 degree elbow as that is where we make up the difference between the two types of sensors.